It appears that official interest rates will continue to fall in the near future, conclusive from data revealed this week. Unemployment levels are on the rise, the mining sector is starting to show weakness as a result of the slowdown in China and not to mention the ongoing concerns from the Euro zone. A reduction in the official interest rate, combined with a fall in rates paid to depositors, will consequently lower the cost of funds for Australian banks. This fall in funding costs should then have a flow-on effect onto consumer finance, where we should see mortgage rates fall to around 5%. Further reason for rates to drop can be attributed to the fact that it has become very unattractive for foreigners to place their money into countries they had traditionally invested in. As a result, foreign investors will choose to invest in more stable economies, such as Australia, therefore creating a larger pool of funds from which the banks can access finance, allowing them to pay less for their deposits. The outlook that mortgage rates are falling will in turn increase property yields for investors and in addition make it more affordable for owner occupiers to purchase their apartment. 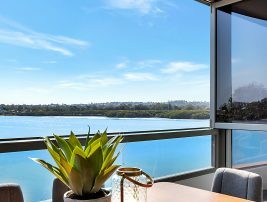 This extra surge of newfound demand will have an immediate impact on property prices, as dwindling supply levels will struggle to keep up, especially within a 20km radius of the Sydney CBD. With 11 prime locations to choose from, there has never been a better time to buy a brand new Meriton luxury apartment.